The path less traveled can be beautiful and inspiring. 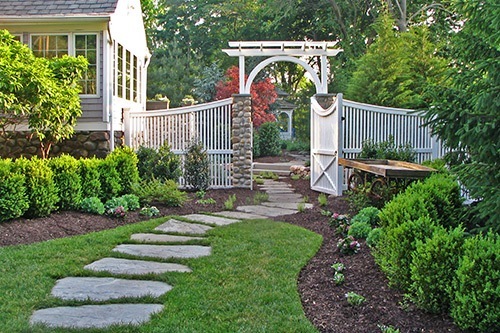 Natural Pathways are cost effective artistic solution to connect your outdoor spaces. The “path less traveled” might actually make your day! Natural Stone Pathways provide a beautiful solution for your secondary walkways, they are peaceful and less expensive than other solutions. While primary walkways need to pass the “High Heels” test, secondary walkways allow us more flexibility. When designing these types of walkways the straight line approach isn’t always the right choice. We will often put boulders and plant material in the garden space to enhance the garden experience. We adjust the size of the stones depending on the area available and amount of expected use. Rocks also become benches and a place to just sit and reflect in a beautiful garden space. 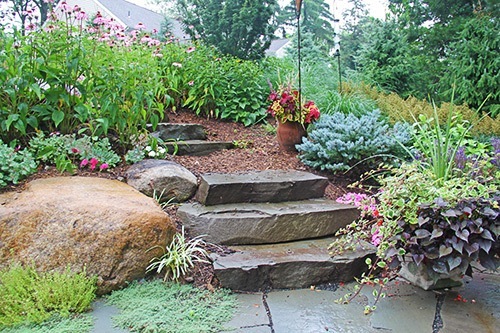 A natural stone pathway is a creative way to move people through your property or gardens. The very nature of the pathway is calming and simply stunning. Sit on a boulder and enjoy a drift of ferns and hosta. These intimate garden spaces will transform your backyard into a place that you will enjoy more and never want to leave. They are ideal for a secondary walkway. The size of the stones can vary, we often interject boulders that the path has to wind around, to create interest as well as adding wonderful places to sit and relax. Many Landscapes are simply to heavy with an abundance of hardscaping, these solutions soften and provide welcome relief with texture, color and fragrance from the plantings we often use surrounding them. Drew is very creative and easy to work with when he develops a landscape design. He also anticipates growth patterns and spaces plantings appropriately. Maintenance crews do a consistently good job and if we ever have an issue (which is very infrequent) John ensures it is corrected and doesn't happen again. It should be noted we have been customers for over 25 years. Generally speaking, the process of contracting with the landscape designer or anyone in the trades, is often times met with trepidation as it’s an area that many of us do not participate in very often. The one thing I very much appreciated and respected about Mr. Shepherd was his ability to “listen”. I consider that a lost art, especially among many contractors who come in with their set ideas on how to complete a project or their thoughts on how a project should look. Before even suggesting design ideas, Mr. Shepherd “listened” to what our needs were and what was important to us. My wife and I found this to be one of the deciding factors in who we awarded the landscape design project to. The job itself was uneventful, timely, and surprisingly on budget. I see all of this as a result of great communication with Mr. Shepherd and his team. At times, we have concerns that once the job is started there would be a lot of additional costs and such; but the only add-ons were ones that were discussed and mutually decided on. His design planning and cost estimates were very much adhered to. All in all, a great experience which speaks to the fact that we are suggesting to our daughter to have Mr. Shepherd work with her on her home in Wyckoff. Magic Landscaping created a front yard landscaping plan, including new brick path and patio and plantings, and installed all of it right at the tail end of the season last year for me. The house curb appeal is so greatly improved, I have no doubt I will get back every penny of the investment when it is time to sell. Drew was great to work with. I highly recommend this company. We have been working with Drew and his team since January. What started as a simple landscape consult became a transformative plan for our main entrance, front yard and driveway. We are very much diy folks but Drew blew us away with his creative and interesting plans. He has an eye for bringing out the potential of a home through landscape, hardscape and even other arcitectural detail/changes. He remains close to the execution once Dan and his team takes over and translates all of the details so the plan is executed flawlessly. Magic was recommended to us by some friends and for once in my life I am experiencing the same excellence they raved about. The entire team at Magic is so responsive which is difficult to find these days. They address our many questions very timely and I have figured out I don't have to worry as the hold themselves to the same high standards we would hope for but usually can't find. The were flexible and understanding as we changed our minds a few times with the timing of the project. Their extensive horticulture knowledge is clear as you discuss plans and walk the nursery. We also had a great experience with contractors they recommended for sprinklers and some construction. In summary- you can trust them, they are true experts and professionals and you get amazing quality, cost is competitive and you will not walk away disappointed. You will also not be surprised with unexpected costs as they dont low ball the estimate just to get your business and then surprise you with lots of other costs. There is no reason to look any further for landscape design or maintenance. I recommend them to everyone I know!!! Generally speaking, the process of contracting with the landscape designer or anyone in the trades, is often times met with trepidation as it's an area that many of us do not participate in very often. The one thing I very much appreciated and respected about Mr. Shepherd was his ability to "listen". I consider that a lost art, especially among many contractors who come in with their set ideas on how to complete a project or their thoughts on how a project should look. Before even suggesting design ideas, Mr. Shepherd "listened" to what our needs were and what was important to us. My wife and I found this to be one of the deciding factors in who we awarded the landscape design project to. The job itself was uneventful, timely, and surprisingly on budget. I see all of this as a result of great communication with Mr. Shepherd and his team. At times, we have concerns that once the job is started there would be a lot of additional costs and such; but the only add-ons were ones that were discussed and mutually decided on. His design planning and cost estimates were very much adhered to. All in all, a great experience which speaks to the fact that we are suggesting to our daughter to have Mr. Shepherd work with her on her home in Wyckoff. Met with Drew and he immediately understood what I wanted! He made a plan that was so unique and creative! Dan and the crew worked and transpired the space. It was better than I ever expected. They created this amazing space at such a fair price that added value to my home that I will enjoy for years. It looks great in every season and after a year it looks even better! I cannot say enough wonderful things about Drew and his team. Drew put so much TLC into the plan...I felt as if he treated the project like it was his own. Another thing that I noticed and appreciated was how the guys communicated and worked as a team. I have done several landscaping projects through the years and this was the best one by far. And certainly the only one I would take the time to write a review for...(I never write reviews...) Kudos to Drew and the fellas at Magic Landscaping!! I look forward to have them continue to work on my property. I can't say enough good things about Magic Landscaping ! I've used them for the past four years and they are professional, reliable, and courteous. This is a class A company! Search no more! Very professional and highly recommended! Drew and team installed our low voltage lighting and maintain our landscaping - we couldn't be happier. Drew has done an outstanding job on our backyard project. The scope of our project changed from a simple pool update to creating a true outdoor space for our family. He extended our living space out into a beautiful yard - thinking through how out family functions to make the yard perfect for us - now and for years to come. Additionally, he was realistic about our budget. He encouraged smart spending on things that are truly value added and eliminated fluff. The end result is just awesome! When we began our journey to put a pool in the backyard, we significantly underestimated the importance of creating a functional, experience based environment for our family and friends. It wasn’t until our first sit down with Drew that this became abundantly clear. From the first conversation, to our ongoing relationship today, Drew has been the ultimate professional, coach, and friend. He set a vision that was built on listening to who we are, what we value, and appropriately built on the ideas that we had brought to the table. The end result is nothing short of spectacular. Every person that works in the yard starts with a moment of silence, shortly followed by pure admiration for the space and the environment Drew has created. If you want someone who appreciates you, listens, and brings years of experience to the table, coupled with amazing results, Drew is your partner. #CustomerForLife! "Very professional and highly recommended! Drew and team installed our low voltage lighting and maintain our landscaping - we couldn't be happier." We guarantee that a consultation with our experts will be time well spent, or we will pay you for your time! We guarantee the workmanship for all of our landscape construction services for a period of ten years. Any repairs that must be performed as a result of improper workmanship shall be performed at no cost to the customer, provided that all payment terms within this contract have been met.